Can you tell us what the specifications are for assembly or does it come assembled? The rack does require assembly. It will come with instructions. You can request them in advance by contacting our customer service department @ 1-800-648-6058. Can this unit be installed with the Grid on the bottom and the Bins on the Top? BEST ANSWER: Note that it says in the specs that they can be staked. If the racks "have" to be on top, I would have a question about the ability to stack, their design, etc Please advise. The unit is designed to have the grid on top and the diamonds on the bottom. They can also be used side by side. This rack is only intended for the diamond bin storage to be on the bottom. Can you stack these one on top of the other? 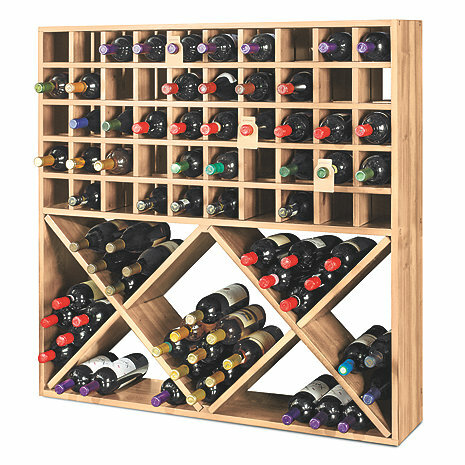 BEST ANSWER: The Jumbo Bin Grid 100 Bottle Wine Rack (Unstained) can be stacked on top of each other. It is strongly recommended that you brace it to a wall for strength and stability. I suggest you attach it to a wall stud for extra stability. I think the answer is yes. You might want to fasten it to the wall. Can the unstained wood be stained without having sand down (i.e. if I chose to later stain) or is there a lacquer on the wood? BEST ANSWER: We ordered the walnut stained rack, so I don't know the answer to your question. Sorry! We did not stain ours, but it appears that you would not have to sand down. I purchased a stained rack, so am unable to answer your question. It can be stained- comes unfinished,. i like burgundy and pinot noir wines...do they accommodate these bottles? BEST ANSWER: Thank you for your question, the bottom diamond portion will accommodate all your burgundy & pinot shaped bottles. Is the top racks large enough to hold Chardonnay bottles or Shiraz size bottles? BEST ANSWER: Yes it will . The opening size will post shortly as well.